The fluter is a chisel that is constantly overlooked and yet very versatile. Fluters are 'U'-shaped in section, so have the advantage of two curves in one tool, the bottom being a tighter radius than the sides. There are variations within fluters: curved sides or straight; sometimes the sides are not parallel but splayed out, it doesn't really matter, they just produce a different character to the cut. With practice, using them on either of their sides produces a flatter cut to its rounded bottom; this means you can keep the chisel in your hands for longer, eliminating the need to pick up another chisel to produce the flatter cut. This is why they are so versatile; by delivering two different distinctive cuts in the wood, you get two chisels for the price of one! Fluters are far more versatile than the uniform semi-circular cutting edge gouges that can only provide one type of cut however you apply it. I personally use the fluter to 'sketch in' my work, similar to how we use a pencil on a piece of paper, but in three dimensions. Having the rounded bottom to the cutting edge means the cuts in the timber do not produce a precise commitment so adjustments may be made. It has been written many times that the parting chisel - 'V' -tool should be used for this procedure, but in my opinion if these chisels are used for this purpose they leave a sharp and specific commitment in the timber that is consequently difficult to remove if errors are made. This only applies when 'parting chisels' are correctly shaped for the purpose they were traditionally intended; most aren't today! Small fluters are known as veiners, though I don't know where the transition starts; they're smaller than 3mm but still have the same characteristics as fluters. The name 'veiner' derives from their traditional function of cutting raised veins on leaves when used in foliage carving. Contrary to all the instruction books and articles I have ever seen, I was instructed during my apprenticeship that the cutting edge should be angled back! Viewed from the side, the angle back should be approximately 70° from the line of the shank and definitely not square. As always there has to be a practical reason for this so let me explain why. With the cutting edge angled back this allows the bottom of the 'U' section to become the leading cut and not the corners and, to my knowledge, there is only one modern day manufacturer that incorporates this feature. 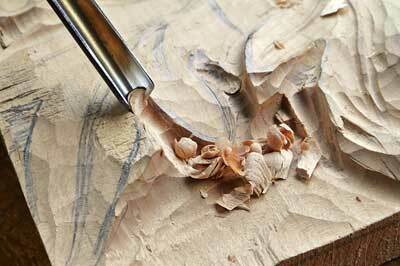 This has an incredible advantage when carving up to a raised form within a piece of work. If the cutting edge is square to the shank then the corners are forward when the chisel is being used at the angle of its bevel. 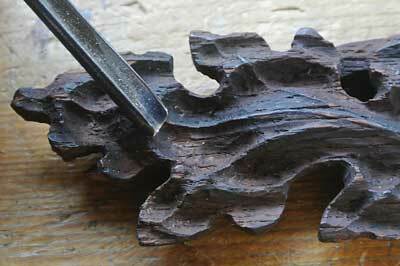 This hinders the efficiency of the work by requiring a second cut with another chisel to finish the cut. Very time consuming! 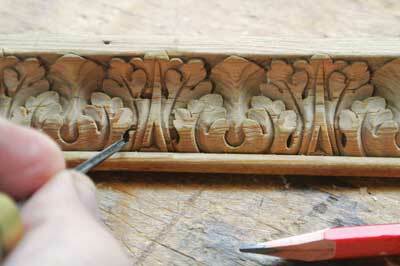 They are useful in many situations such as foliage carving. With a couple of fluters of different sizes, most of the internal work of leaves may be done and the external shape sketched in. The advantage of the angled-back cutting edge helps create deeper hollows that also help with the cutting of Gothic-style foliage. For the acanthus leaf, which is part of the strict format of classical carving, the fluter is used for cutting the 'eyes'. These are deep oval holes, all identical and positioned symmetrically in pairs along the centre vein, looking like a row of eyes. It also assists in creating the pipes that connect the eyes to the stem but taper in the opposite direction to the stem. Holding the handle lower than the angle of the bevel means the bottom of the cutting edge doesn't bite and the sides of the fluter may be used along a raised form such as the sides of a raised vein. You can see just in the carving of foliage in all styles the chisel rarely leaves your hand and with maybe two different sized fluters and the addition of two or three fishtails, the execution of a leaf will be restricted to about five chisels. 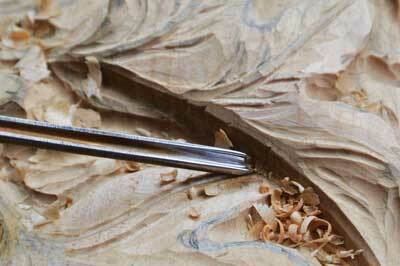 For carving hair, the vast majority of the work is done with three fluters of different sizes that provide six varying cuts in the timber, generating a variety of shadows to make the work vibrant. 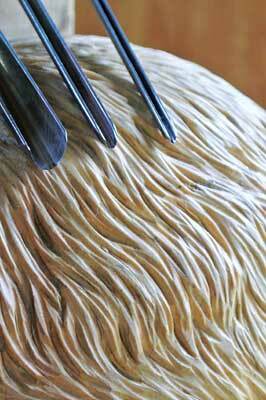 If done with a parting chisel - when sharpened correctly - the hair tends to look like a thatched roof. 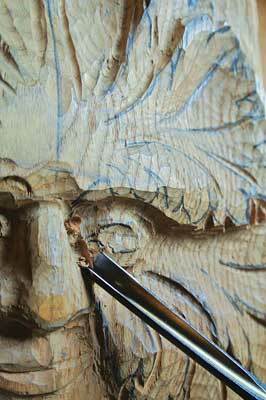 My DVD, Carving the Human Head, explains carving hair in greater depth. Traditionally the fluter is just one type of tool that we constantly use to reduce the number of chisels utilised on any particular item; this in turn reduces the time taken to execute the work. Ultimately the urgency of executing the work helps to produce carvings with the character of 'cut' associated with the profession. Have a flirt with a fluter - it is such a versatile chisel - you get two for the price of one. In the next article I will be discussing how some carvers and manufactures insist on sharpening parting tools; this destroys the traditional cut and is, for me, a major 'soap box' moment!